He just learned ~そう=~sou at school and asked me how to use it. Hope this lesson helps many of you as well. First, I’ve got a question for you. Can you tell the difference? = Gogo wa ame ga furi sou da. = Gogo wa ame ga furu sou da. =Ashita wa atsu sou da. =Ashita wa atsui sou da. Yeah, it seems to be just a small difference but the meaning is quite different. 1) It seems/looks like it’s going to rain in the afternoon. 2)It is said / They say / I heard it’s going to rain in the afternoon. 3) It seems/looks like it’s going to be hot tomorrow. 4)It is said / They say / I heard it’s going to be hot tomorrow. 1) and 3) are based on your opinion or feelings and it means It looks like ~, It seems like ~,. and 2) and 4) are from what you heard. You got that information from other people or another source.It means It is said / They say / I heard… →I will teach you these some other time. Let’s check the grammar patterns first. Typical mistake: You might think “looks cute” is かわいそう ( = kawaisou) but that would be wrong. かわいそう=kawaisou means “poor thing” . So just be careful not to say, あなたはかわいそう！= Anata wa kawaisou! Then how do you say “looks cute”? You don’t use そう=sou for かわいい = kawaii = cute. = Kare yasashisou na hito dane. = It seems like he is a sweet person! = Kono eiga omoshirosou desune. = This movie looks interesting. = Onaka ga suite shinisou! = I’m dying (of hunger).→I am starving to death. = Jugyouchuu ni nemurisou datta. = I almost fell asleep during the class. =Kare ga amari ni yasashii node nakisou ni natta. =He was so sweet that I felt like crying. = Barusa ga mata riigu yuushou shisou da. =Looks like Barça is going to win the league again. =Kujikesou ni nattara itsudemo kono kyoku wo kiite! =Whenever you get discouraged, listen to this song! There is another patternwith 可能形 = kanoukei ( = can-verb ) + そう (= sou). 書けそう = kakesou = It seems like someone can write, It seems possible to write. = Nanka yareasou na kiga shitekita. = Kore, watashi demo tsukuresou! = Even I can make(cook) this. = Is it ready to eat now? / Do you think we can eat now? / Are you ready to eat now? = Hey, do you think you can make it today? We don’t use そう ( = sou) with a noun. x 彼女、マギーそう！ ( = Kanojo Maggie sou!) →wrong! =Watashi wo miruto “Oishisou!” tte iu hito ga ooin dakdo.. Thank you sensei as always! They are both possible but B1 is more natural. The difference is the speaker is more certain in B1. B1: I think someone is in the classroom. B2: I’m not sure but it is possible that someone is in the classroom. Thank you for helping me that point. Could you show me more about the case that only よう is possible but そう is impossible please ! I am unable to categorize them. Thanks Maggie sensei for always being kind ! When you want to say “It looks like ~ ” (assumption), you can use よう with a past tense but you can’t use そう with a past tense. It looks like someone was in the classroom. 誰かここにいたそうだ it means I heard someone was here. verb past tense + そう　is only used to quote what you have heard/read from someone. Wowwww….Thanks Maggie sensei a lot. The person who takes off the mask is the listener, “you”? If so,I think you got the meaning. “If you had taken off your mask, they (people around you or particular people depending on the content) would be very scared. Also there is another negative form but it has slightly different. 面白いそうな映画を見たい – I want to watch the movie that I heard is good. 面白いそうな映画 – the movie that I heard is good → The meaning changes but you say 面白そうな映画 (The movie which looks interesting) the speaker thinks the movie is interesting. Thank you for your lessons, Maggie sensei! I find them very useful. I have trouble understanding the difference between “sou desu” and “you desu”. When do we use sou and you? Basically when you judge from the appearance/what you see, you use そう and when you judge things by having observed them or gathering information, you use よう. 雨が降りそうです。It looks like rain. /It is about to rain. 雨が降るようです。It will probably rain. / It is likely to rain. Doesn’t yasashii + youna + hito mean “a person who seems kind”? I see your confusion. I added the note for you in my ような lesson. adjective + ような＋noun / person works when you quote or express your feelings. Someone was saying he seems like a sweet person. = I feel like he is sweet to me. would the same apply to ‘afuresou’ ? like, it looks like it will overflow? = Ofuro no oyu ga afuresou desu. How does あとで話そう translate into “Let’s talk later” based on this lesson. I understand the following points from what you taught. But I’m not sure how this “そう” in this sentence means “let’s”. This そう is different. It is a volitional form of verb. 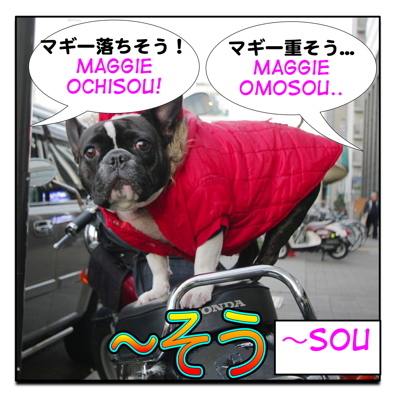 One question Maggie sensei.If it is not used with nouns, then 夢だそうです means I heard it is a dream? Any tips for remembering the difference between the two そうです? I keep mixing them up and using the wrong verb conjugations. Ex. 重い = omoi = 重いそうです。 I heard it’s heavy. Ex. 雨が降る= ame ga furu = 雨が降るそうです。 I heard it is going to rain. Hi Maggie-sensei! Thanks for the explanations regarding そう. Does it have the meaning of “It looks like it is engaged in that particular activity/state”? For example, パンを買ってそうだ。 Does it mean, “It looks like (they are) currently buying bread”? I think what you meant is this pattern. She appears to be a person who buys bread everyday without making boxed lunch. “It looks like (they are) currently buying bread”? I am teaching senior Japanese for the first time, and one of the sections in the textbook is about using そうな and　そうに, and I am struggling to explain the difference to them. It has been a few years since I have used my Japanese, so getting it all back is difficult! Are you a Japanese teacher? そうな modifies a noun and is used as an adjective. そうやっていつも迷っちゃうんだから How about it here? My attempt is: that’s how we are going to get lost because of you. This was very useful and detailed. Thank you. I know you covered 重そう　which is the adj + ending removed + そう but I was wondering what about if someone says “Maggie, you seemed to have lost weight”. I was thinking you could say something like “痩せたみたいです” but is it possible to use そう because its the past tense so I’m not sure if that makes sense. そう is only used to describe the current or sometime future condition. 彼はいつも私に英語を教えてくれそうです。 Does that make sense? * No doubt here… I hope. By the way, do all those forms even exist? It is possible to say 降りそうではありません / 降りそうではない but 降りそうもない／降りそうもありません are more common. When you use そう in a negative sentence, we often add も to stress the meaning. Thanks for the fast reply, it REALLY helped me a lot! Those are very confusing. In conversation we say them both but grammatically 行かなそう is correct. Yes, because we use 〜なさそう form a lot in conversation. As for your suggestion, I know it would be nice to have a complete conjugation chart here but there are a lot of sites where you can check them out there already so….. If it’s not used with nouns, then such sentence is incorrect, right? What do you mean by “きんじつ”? Sorry for the late reply. I was on vacation. “It seemed fun”? = “楽しそうだった”? and you are right, if you say マギーらしい it refers to my personality or what I would do. BTW I will take vacation from tomorrow so I may not be able to answer your question for a week but will get back to you when I come back. With 「使ってもかまわないでしょう」 I was trying to say “Maybe it’s ok to use it only in songs” because songs often say things in a way that we wouldn’t really use in our daily life. I’ll check the らしい　lesson! Have a great time on your vacations,　先生! Sensei, I forgot to ask about the 2nd PS. Is it possible to use ～そう　with verbs in past? I mean, to tell how you think that something happened. For example, would 「車で衝突した？酔っていたそう。。。」 make sense? I hope you had had great vacations! Yes you can use そう with a past tense.